* You can partially mash them in a food processor, then finish with a fork. If you use the food processor completely, the chickpeas get too mashed up. But since the food processor was then already used for the peas, I used it to chop the rest of the ingredients. Time saver! 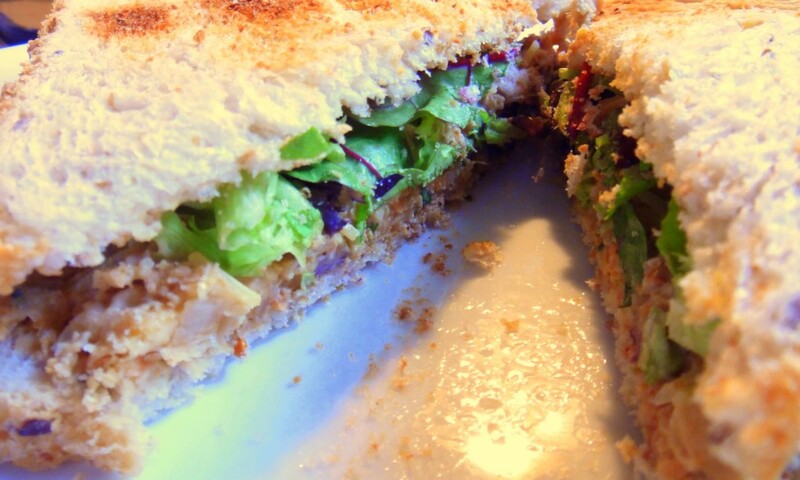 No tuna or chickens were harmed in the preparation or consumption of this sandwich. I like this in-between two slices of toasted whole wheat bread (or similar healthy bread) or you can use tortillas, pita bread or anything else sandwich-capable. Step 1 In a mixing bowl, mash the chickpeas with a fork*. Step 2 Add the remaining ingredients and stir until thoroughly mixed. Step 3 Spread on fresh buns or toast. Top with cheese, lettuce, spinach or whatever suits your fancy. 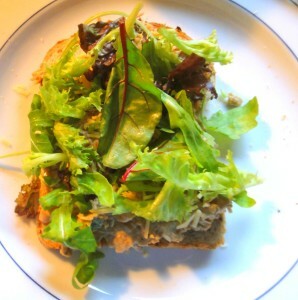 This entry was posted in Food, home + garden, Sandwiches and tagged bread, carrots, cheese, lunch, mayo, onions, recipe, sandwich, soy sauce, toast, vegetarian on 16 October 2012 by peas.